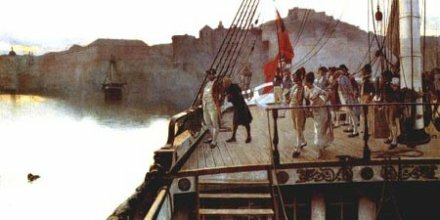 On this date in 1799, Admiral Francesco Caracciolo was hanged by the British commander Horatio Nelson from the yardarm of the Sicilian frigate La Minerve in the Bay of Naples. Poor Caracciolo (English Wikipedia entry | Italian) — and not to be confused with the Italian saint of the same name — got middled by the French Revolution. But he seems to have been troubled by that flight by consciousness of a conflict between civic duty and duty to sovereign. 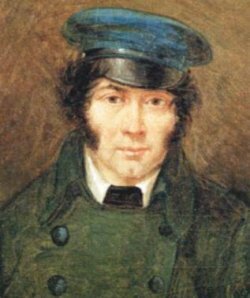 With said King a-riot offshore, French conquest initiated in January 1799 the Parthenopean Republic, a fine obscurity for a pub bet today, but for Caracciolo a matter of life and death. He’d returned to Naples, supposedly to tend to his personal affairs; his prominence and popularity, he found, required him to choose between his allegiances. Under whatever inducement of conscience or calculation, Caracciolo put to sea for the new Republic and engaged the Parthenopeans’ enemies, actually preventing one British landing attempting to restore his former boss. Alas, the French — by whose arms alone was the puppet Republic supported — soon decamped for greater priorities than Naples, and the royalist elements had the city back in hand by June. While the political revolutionaries would face their own reckoning, the Jacobin admiral was caught attempting to fly and delivered to Nelson for the most summary simulacrum of justice. 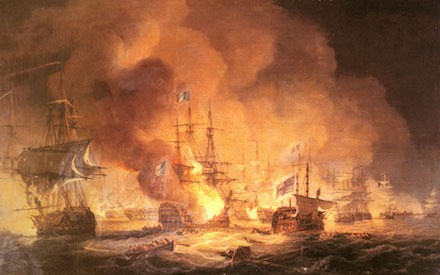 Fairly or otherwise, this incident is one of the very few blots upon the beloved Nelson’s reputation. That’s partly for the haste with which it was conducted and partly for the jurisdictional matter of the British — to whom Caracciolo owed no loyalty, and against whom he had committed no treachery — doing the Bourbon monarchs’ dirty work by receiving the prisoner, conducting the trial aboard a British ship, and directing the sentence. And it was all over under that single day’s cloudy sky. Caracciolo was brought aboard the Foudroyant that morning, a five-member panel of Neapolitan royalist officers rounded up to try him, given a two-hour trial, and condemned to hang that very evening at 5. (Requests for a soldier’s death by shooting, or a day’s time to make peace with one’s maker, went begging.) At sunset, the body was cut down, loaded with weights, and cast into the sea. They figured that was the last they’d seen of the admiral, but a few days later — with King Ferdinand now having moved onto the Foudroyant — the corpse somehow bobbed up to the surface right beside the ship, like a revenant spirit come to accuse the royal still too nervous to reside in Naples. “What does that dead man want?” the shocked king is supposed to have exclaimed as he took sight of it. Ettore Cercone, L’ ammiraglio Caracciolo chiede cristiana sepoltura (Admiral Caracciolo requests a Christian burial). Horatio Nelson and Lady Hamilton are in the foreground. He got it. An 1881 epitaph in the Chiesa di Santa Maria della Catena can still be read in his honor. Naples’ harbor-front street, from which one would have had a fine view of Nelson’s fleet back in the day, is today known as the via Francesco Caracciolo. The Republic of Italy’s navy had a Caracciolo-class battleship type in production in the 1910s, but the line was discontinued before any of the four vessels reached completion. * Sister of Marie Antoinette. ** Where Lord Nelson was banking the proceeds of his recent Egyptian exploits in the famously pleasing form of Emma, Lady Hamilton, the wife of the British envoy to Naples. † Apropos of the preceding footnote, there’s been some grousing about Lady Hamilton’s role in all this. She was an intimate of the temporarily exiled queen, and the old Encyclopedia Britannica entry on Caracciolo slates her with having exploited her hold over the infatuated Nelson to work Maria Carolina’s vengeful will. We’re inclined to suppose that Nelson’s own reasons of warcraft-slash-statecraft, attempting to swiftly cow any potential Neapolitan resistance, suffice as explanation — whether right or wrong.